32 pages with diagrams. Octavo (8 1/2" x 5 1/2") issued in wrappers. Introduction by J M Rice, B P Barnes, C Vaughan; preface by C E Kemp. (Betts: 32-48). First edition. No more published. 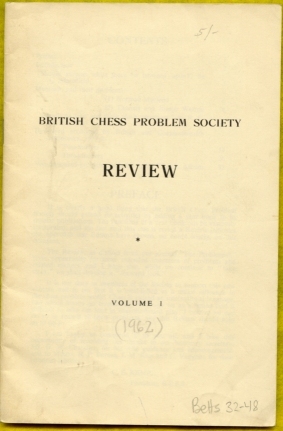 135 honored, problems by the Society's British and Commonwealth members, from the years 1957-58 and 8 non-honored problems which were included in the FIDE album. Short articles by C Mansfield, J Warton, N A MacLeod and R C O Matthews add a further 46 problems to the total. In all, includes 82 three-movers and 107 tow movers with solutions. Lightly soiled, light edge wear else a very good copy.